This is another edition of Friday Dance Party on Acorns On Glen. It’s the time where we give thanks for living another week. We give thanks for making it through one more week and for being able to celebrate the fact. How do we celebrate another week of living? We dance. Are you alive this Friday? Did you give thanks for that? Spring is in full force here. We woke up this morning and watched the beautiful wedding of the new Duke and Duchess of Cambridge. How wonderful was that? They were glowing. After going outside, we were thrilled that today is pushing 70 degrees, with bright sun and no one walking down the street with a coat on. This is a first for us in quite a long time. We are in New York City today and everywhere you look, there are blooming tulips, daffodils and other bright-colored blooms. 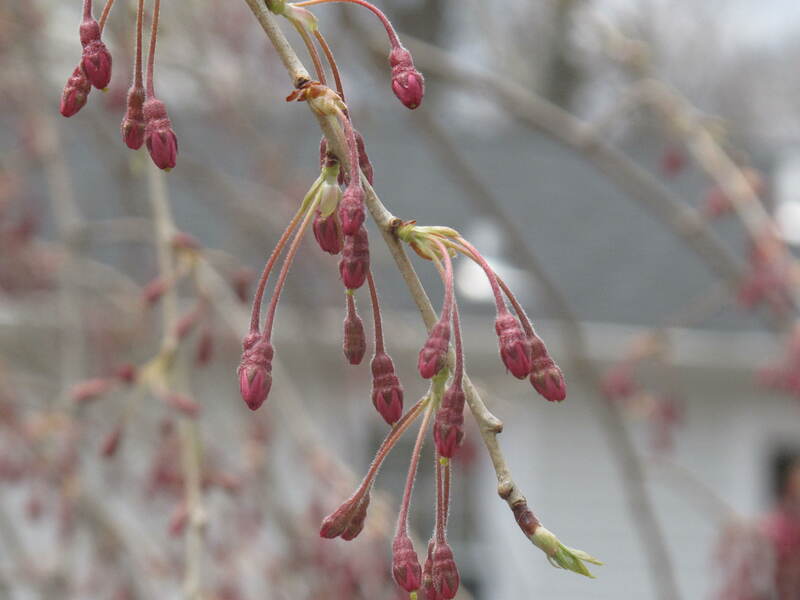 The trees are budding and you can help but smile. You have to love it….and if you don’t, you’re out of here. So with that being said, it is only fitting that we bring in Shania Twain for our dance party to sing one of her first big hits. I love this song and like this very modern take on a country song. So turn your speakers up and get your groove going. This is a fun one. Go ahead and dance and if you can do it with some bright sunshine beaming onto your shoulders, even better. Is it a warm and sunny Spring day where you live? Horseradish (Armoracia rusticana) is in the brassica family, which includes turnips, kale, mustard greens, broccoli rabe, daikon radish and many other plants with varying degrees of pungency and a similar taste. Native to the temperate regions of Europe and Asia, it is an ancient herb. 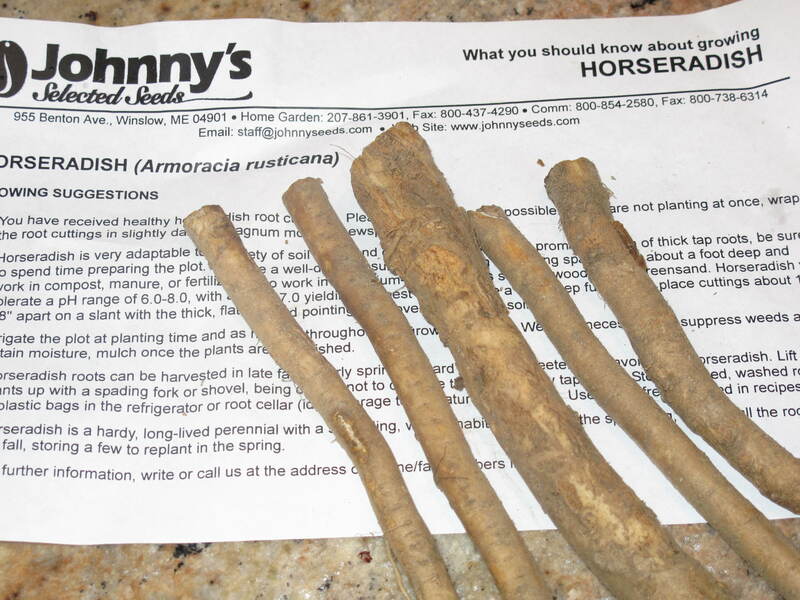 The Romans carried horseradish to Europe as a medicinal herb and as a flavoring. It was cultivated in Egypt before the exodus of the Hebrew slaves around 1500 B.C., and is often the symbolic bitter herb at the Passover Seder. 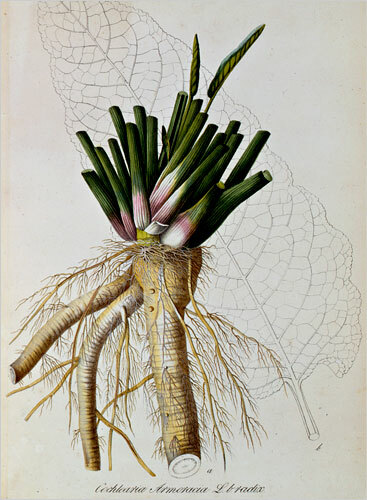 By the 16th century, the pungent root was spreading throughout England, where it was described for its many uses, including as an aphrodisiac, a treatment for tuberculosis, a mustard plaster and a dewormer. The common name probably evolved from the German “meerrettich,” which means sea-radish, which was misunderstood by the English, who associated “meer” with “mahre,” an old horse. Undisturbed, the root doesn’t have a strong smell or flavor. But crushing or grinding it produces isothiocyanates, a kind of mustard oil, which is what gives horseradish its flavor and heat. Adding vinegar stops the reaction because it’s an acid. It also stabilizes the isothiocyanates, so you can still get that flavor a week later. Tradition calls for grinding the root outside, because the chemical reaction triggered creates a gas that not only makes you weep, but can irritate lungs and nostrils. This is actually a defense mechanism for the plant if it’s wounded. We planted our horseradish in a long furrow about six inches deep. Each root has a top and a bottom identified by the slicing made by the grower. The top is identified by a straight slice and the bottom is identified by a diagonal slice. 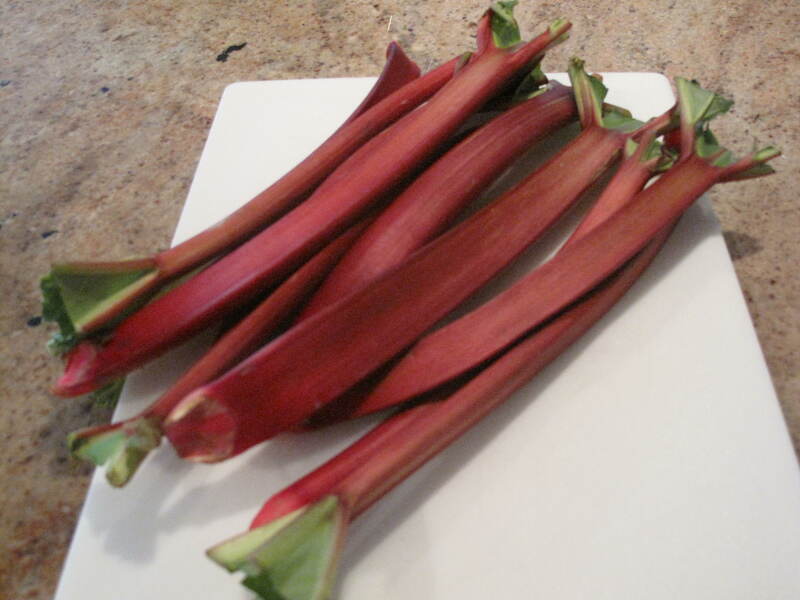 When we placed them in the furrow, we put them in at an angle, with the straight sliced top pointing upwards. Once in place, we covered the top of the roots with about four inches of soil, pressed the soil into place and watered. While we won’t harvest any horseradish this year, the roots will produce beautiful green leaves that will make a nice complement to the equally as beautiful rhubarb leaves that we previously planted along the back side of the espaliers. Next year, we will harvest and grind a few of the roots, add some white vinegar and salt and begin to enjoy some heat. As my Grandmother used to say, we can only harvest the roots in months that contain an ‘R’ in them. Months that don’t contain an ‘R’ are too hot and the root will not produce optimal flavor. 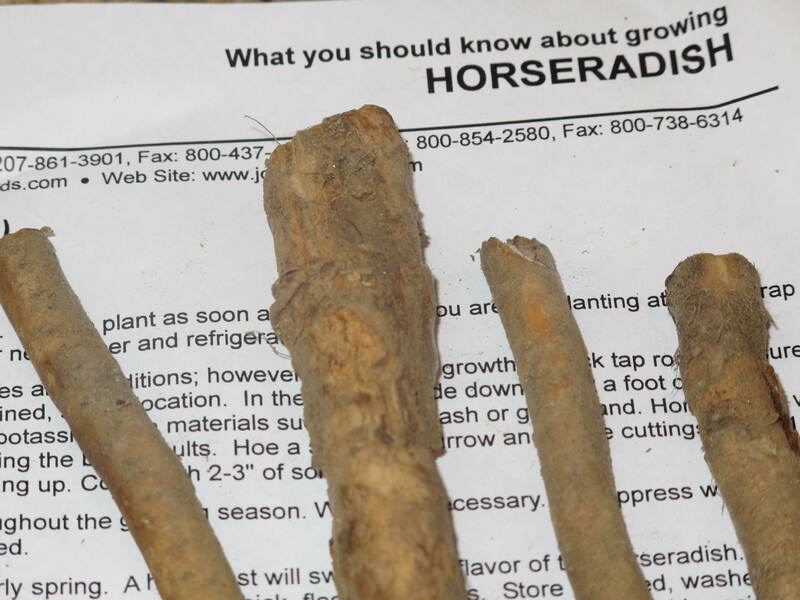 So here’s to horseradish, named “Herb of the Year 2011” by the International Herb Association. We will look forward to your pretty leaves this year and then the addition of your hotness to our meats, mashed potatoes and seafood in 2012. We can’t wait. What hot foods do you and your family like to cook or eat? This is Grace Kelly. As you can see, it is not the actress/princess that you were thinking. 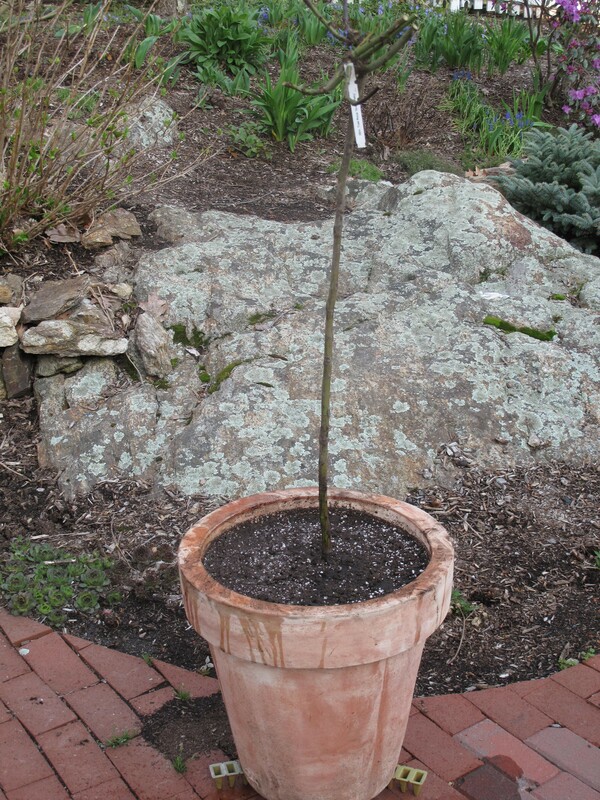 ‘Grace Kelly’ is a variety of tree rose that we planted in a container this weekend so it can begin growing in time to bloom this Summer. We have had tree roses on the patio almost every year we have lived here on Glen Road. 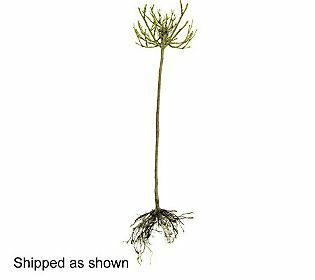 They have always grown quickly from the dormant tree that we get shipped to us. In early Summer, the tree rose begins to bloom and if you are diligent about removing the spent roses, the tree will continue blooming up until the end of the season. Tree roses are not actually a class of rose, but rather a way of growing them. 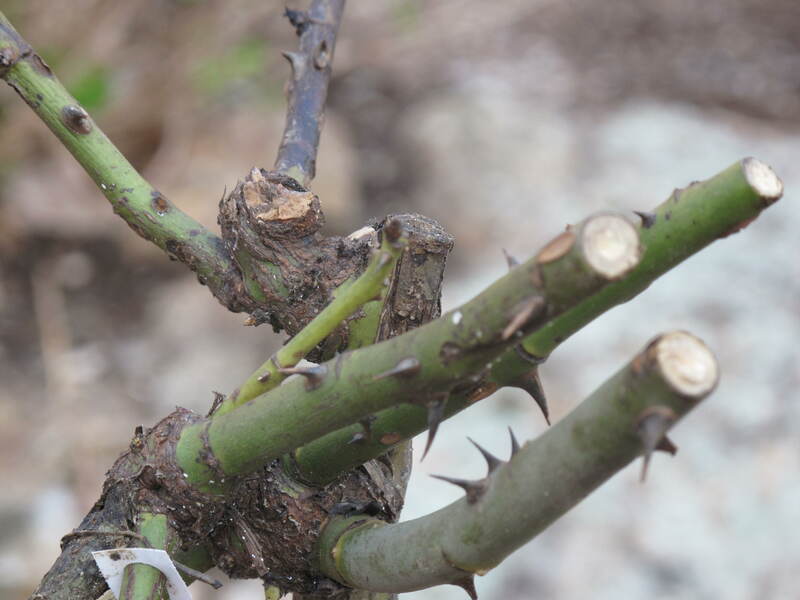 A bush or climbing rose is simply grafted onto a straight trunk, giving the desired appearance. Here is the rose bush that is at the top of the tree we purchased. Very similar in appearance to a rose bush that you would buy at a nursery, except it is attached to the top of a long trunk. 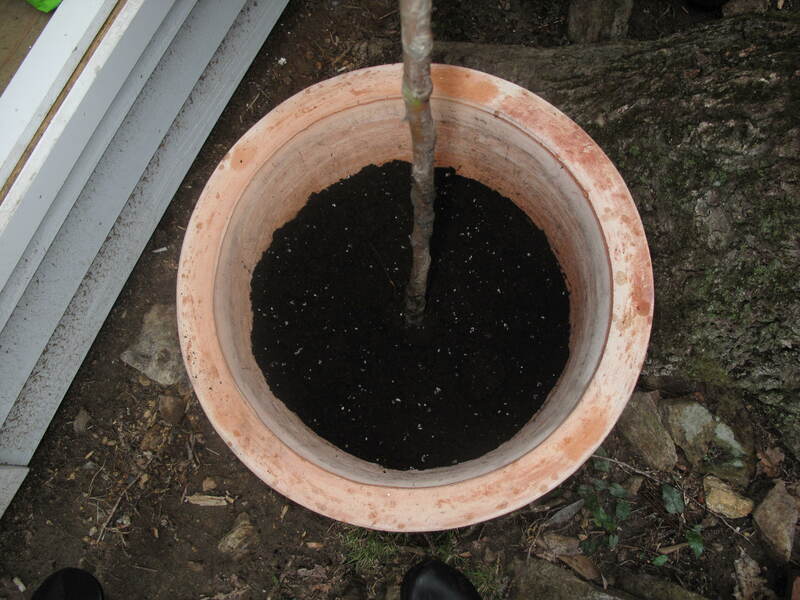 The roots are about five inches long and we have always just filled a container with organic potting soil and put the tree rose into the soil so that it is covered up to the base of the trunk. They require very little care other than providing about an inch of water per week and fertilizer every so often. At the beginning of June, our tree roses have always produced an array of beautiful, full-sized rose buds. 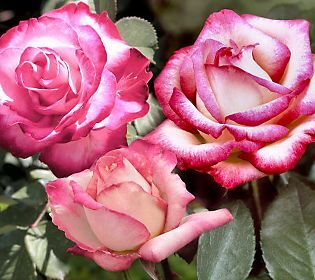 The variety ‘Grace Kelly’ appears as beautiful as the woman it is named after. Pale pink roses tipped in a dark pink to red. Here are some pictures of our desired end state. Grow, girl, grow! 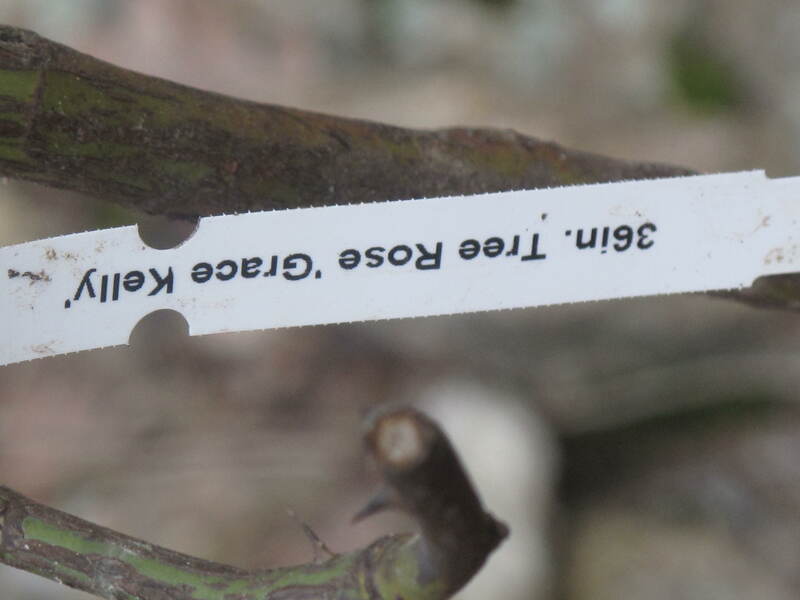 So now Glen Road has had its first celebrity (er, celebrity tree rose) come visit in 2011. Again, we have always planted these beautiful plants every year on Glen Road. Since they are a perennial, you can also winter them and bring them back year after year. To winter in mild zones, you need only wrap in-ground plants in straw or burlap. To winter in northern zones, you must bend the plants without breaking its roots and cover with soil. Containerized plants can be moved to an unheated, protected area. 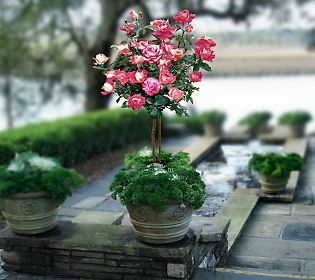 Give a tree rose a try to brighten up your patio this Summer. They are readily available on the internet and aren’t that expensive. When’s the last time a princess stayed in your backyard? Tell us what plants you are planting on your patio and deck this season? This pie always reminds me of Spring. 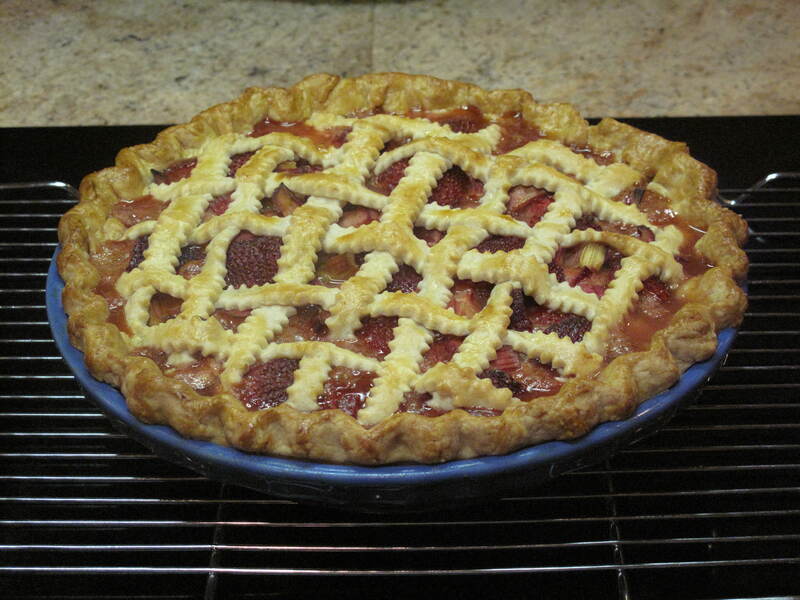 It is a rhubarb and strawberry pie with a lattice top crust. Making a pie is always intimidating to me. It’s the crust. Either I have a problem rolling it out or I have a problem getting it into the pie pan. A lot of people tell me they have the same issues, but I keep trying to perfect the art of pie making here on Glen Road. This pie was a surprise in that for the first time in a long time I didn’t have any issues. 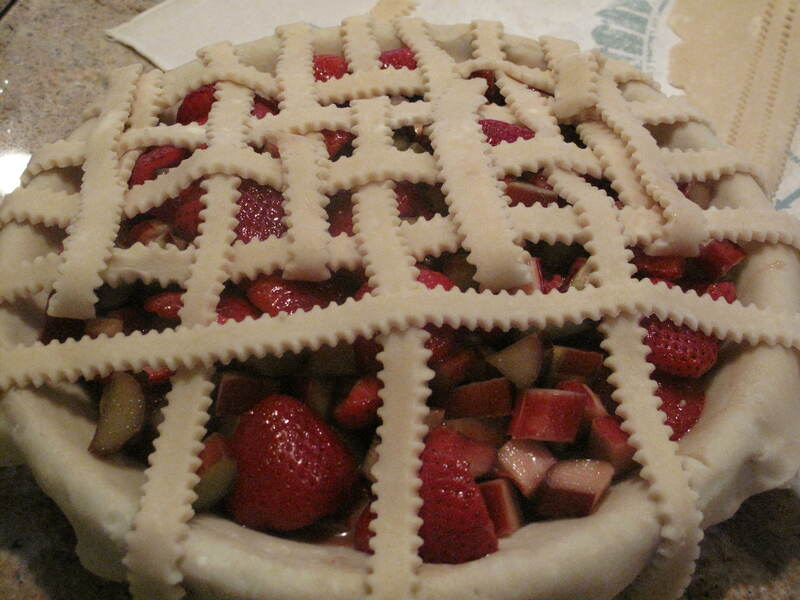 I even put a lattice top on it without making myself nuts. It must have been the deep breaths and the frequent praying. 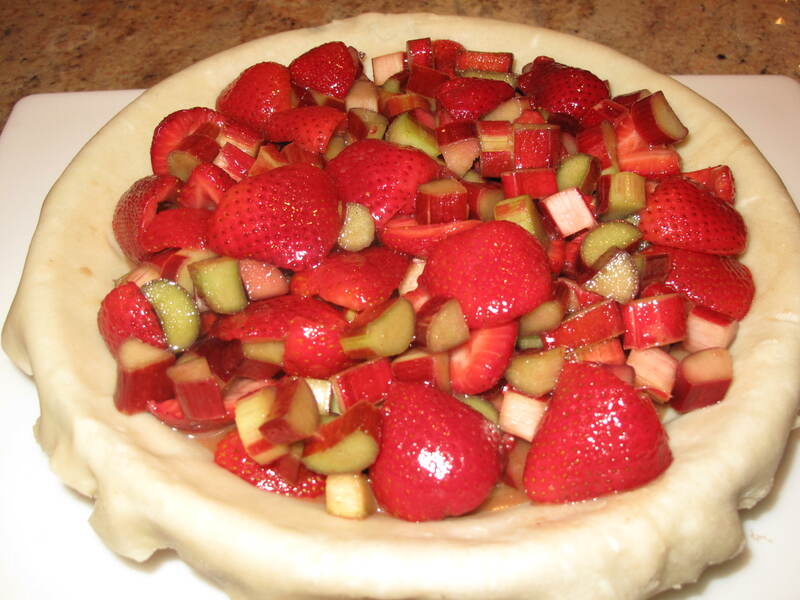 The idea of rhubarb and strawberries mixed together in this pie was so perfect for Spring. I couldn’t wait to get a piece. 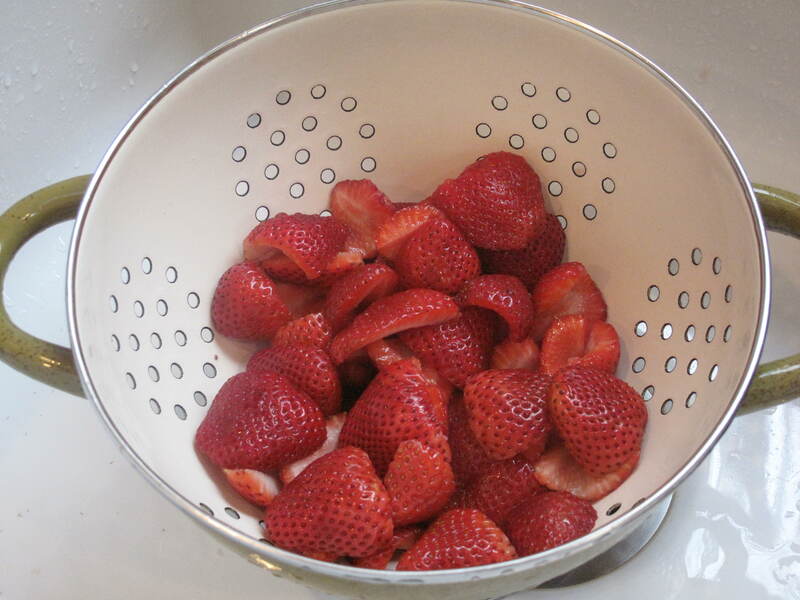 We’ve talked about rhubarb and strawberries a lot here on Acorns On Glen. Spring just seemed the perfect time to mix them together for everyone to enjoy. Let’s get baking! 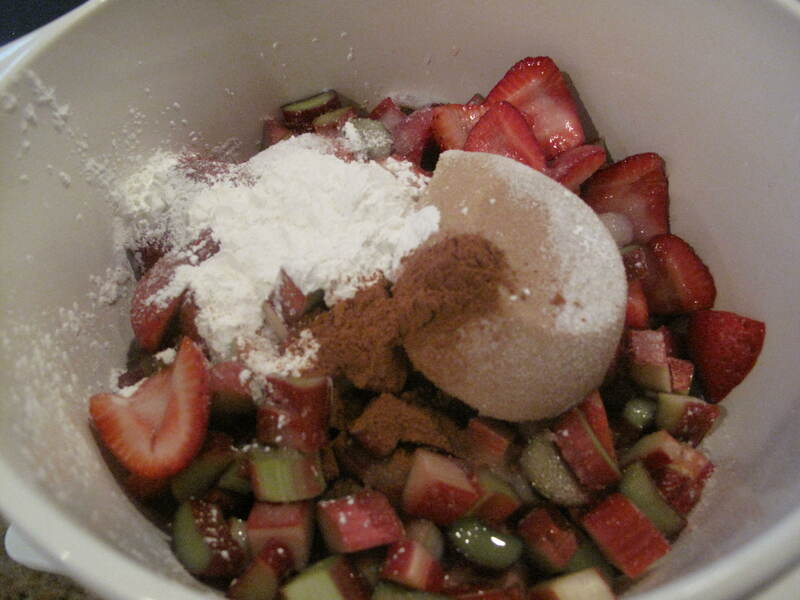 Make crust: Combine flour, sugar and salt into a food processor. Using the pulse button, cut in shortening and butter into the flour mixture until coarse meal forms. Blend in enough ice water (2 tablespoons at a time) to form moist clumps. Gather dough into a ball; cut in half. Flatten each half into a disk. 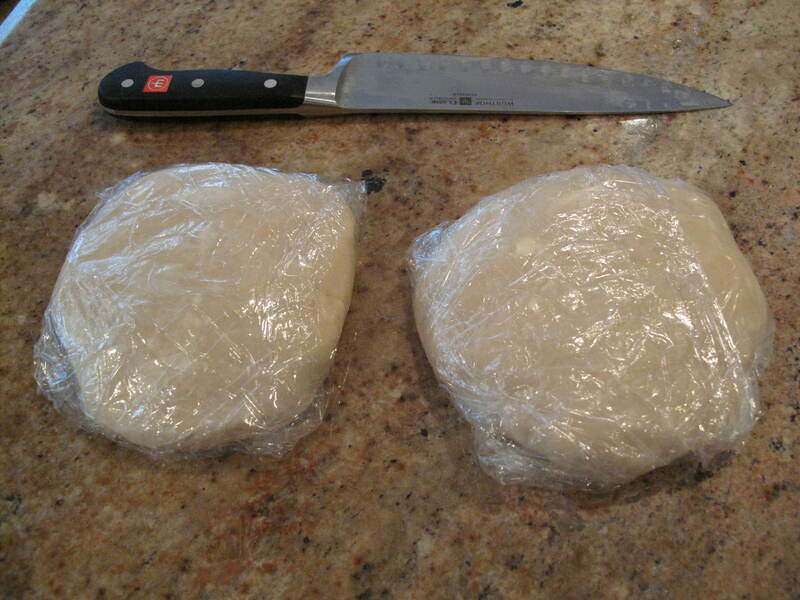 Wrap separately in plastic; refrigerate until firm, about 1 hour (can be made 1 day ahead. Keep chilled. Let dough soften slightly at room temperature before rolling). Make filling: Preheat oven to 400°F. 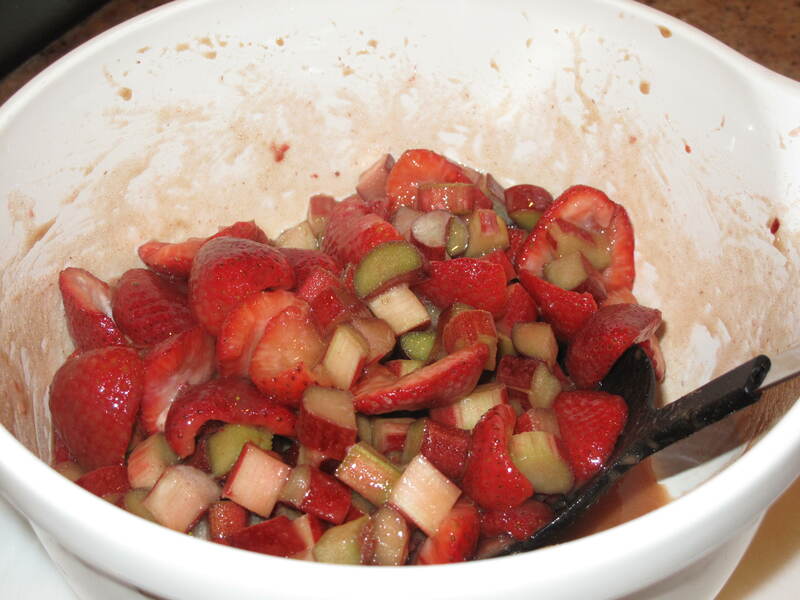 Combine first 7 ingredients into a large bowl. Toss gently to blend. 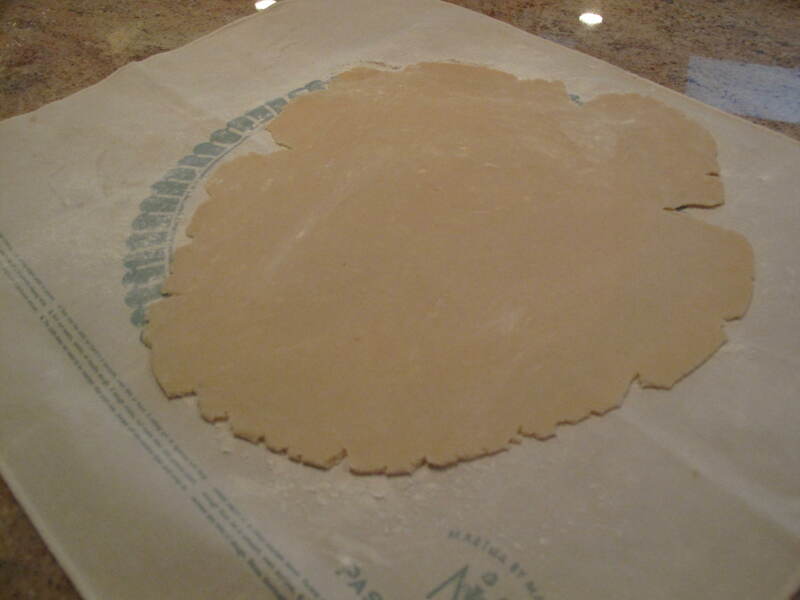 Assemble pie: Roll out 1 dough disk on floured work surface into a 13-inch round. Transfer to a 9-inch-diameter glass pie dish. 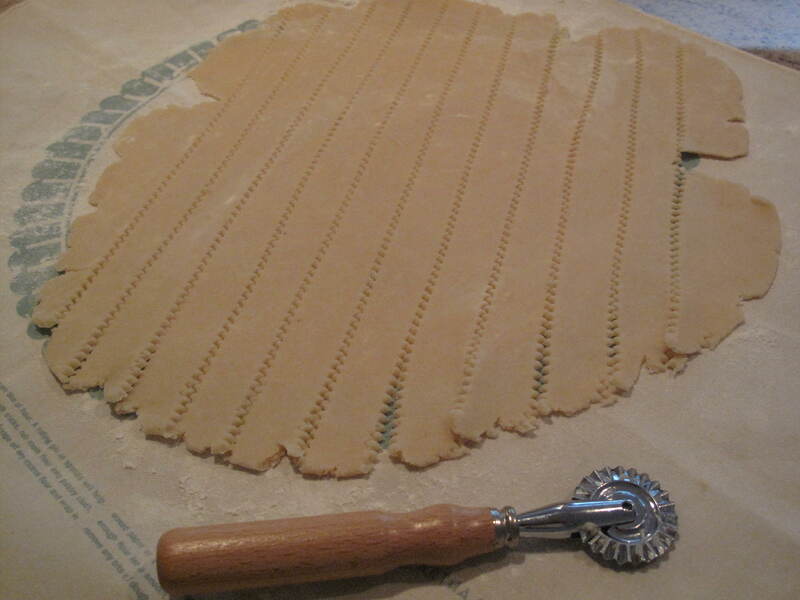 Trim excess dough, leaving a 3/4-inch overhang. Place into refrigerator so the crust can continue to chill after being worked with in this step. Chilled pie dough bakes the best. Roll out second dough disk on a lightly floured surface into another 13-inch round. Cut into fourteen 1/2-inch-wide strips. Spoon filling into crust. Arrange 7 dough strips on top of filling, spacing evenly. 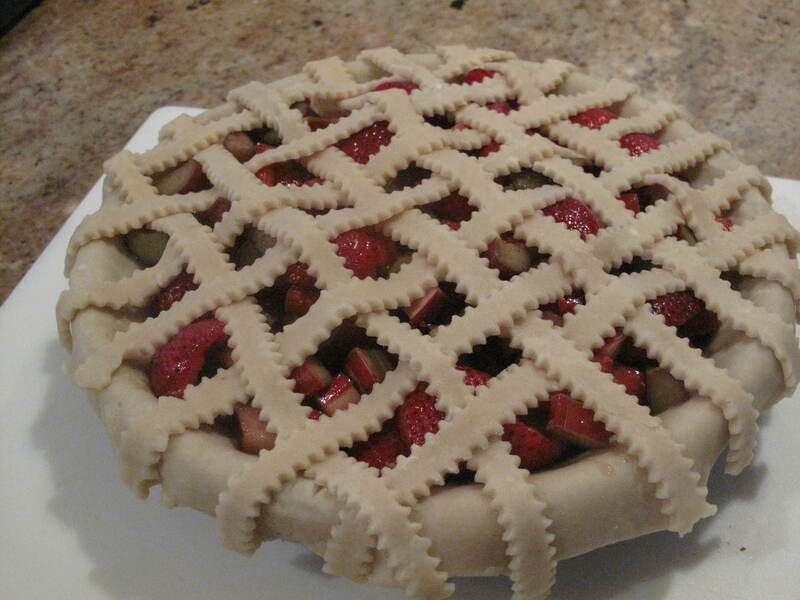 Form lattice by placing remaining dough strips in opposite direction on top of filling. Trim ends of dough strips even with overhang of bottom crust. Fold strip ends and overhang under, pressing to seal. Crimp edges decoratively. Brush glaze over crust. 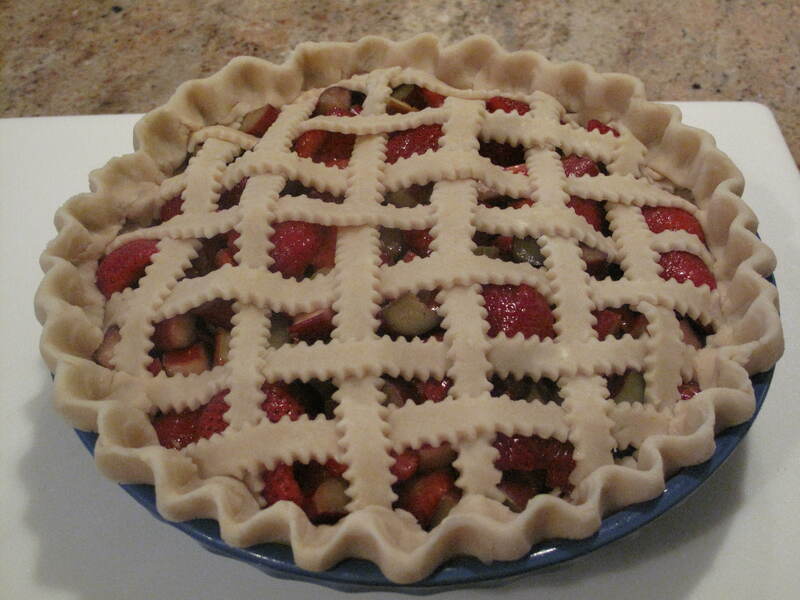 Place pie back into refrigerator so that it can chill again for several minutes. Chilled pie dough bakes the best. Transfer pie to baking sheet. Bake 25 minutes. Reduce oven temperature to 350°F. Bake pie until golden and filling thickens, about another 30-35 minutes. Transfer pie to rack and cool completely. 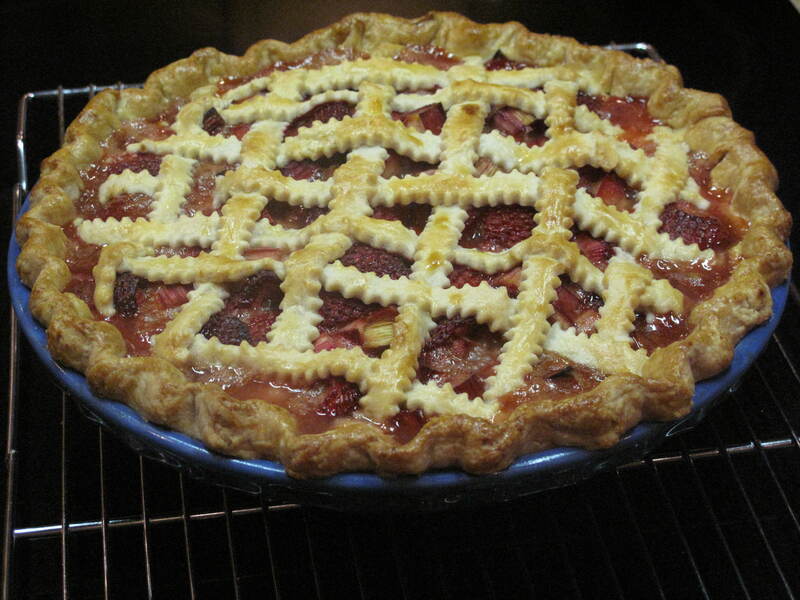 During cooking, it is important to keep an eye on the pie and keep baking until the sauce in the pie gets thick (versus watery in form). This may mean you will need to cover the edges of the crust with aluminum foil or a crust cover to prevent it from burning. Once the sauce is thick, you know the pie is ready to take out of the oven. The sauce will continue to thicken during the cooling process. You can eat this pie plain or with a scoop of ice cream on top. Eating something fresh and in season is the eighth wonder of the world. This pie is the right pick for Spring. I hope you like it. What other Spring recipes are you cooking in your home? Place ingredients into a martini shaker with ice. Shake well with ice and strain into a chilled martini glass. Using a small knife, make a slice upwards under the ribs of the chocolate bunny. 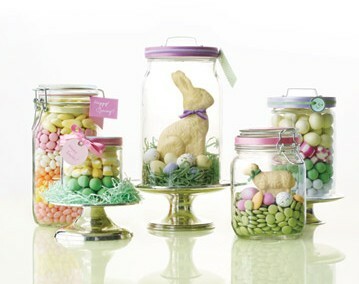 (Attention animal lovers: this will not hurt the bunny). Hook on the rim of the martini glass and drink. 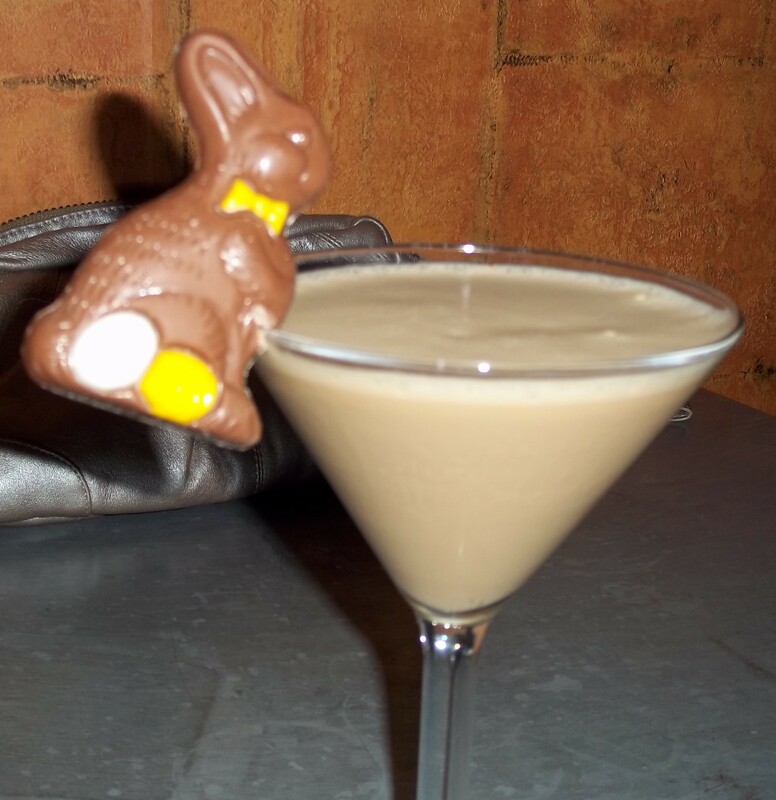 Enjoy your bunny martini and have a Happy Easter…..if you can remember it after drinking this martini. What holiday themed drinks do you make for your family and friends?